Cook pasta according to package directions, omitting salt and fat. Add broccoli to pan during last 2 minutes of cooking. Drain. While pasta cooks, place bacon in a large skillet over medium-high heat; cook 4 minutes or until browned, stirring occasionally. Remove bacon from pan with a slotted spoon; reserve 1 1/2 teaspoons drippings in pan. Sprinkle chicken with 1/4 teaspoon salt. Add chicken to drippings in pan; cook 4 minutes. Sprinkle with garlic; cook 2 minutes, stirring occasionally. Sprinkle with turmeric; cook 30 seconds, stirring frequently. Combine remaining 3/4 teaspoon salt, milk, stock, and flour, stirring with a whisk. Add milk mixture to pan; bring to a boil, stirring frequently. Cook 2 minutes or until thickened. Add pasta mixture and 2 ounces cheese; toss to coat. Pour into 2 quart baking dish, sprinkle with remaining 3 ounces cheese and bacon. Bake until cheese melts and bacon begins to brown. 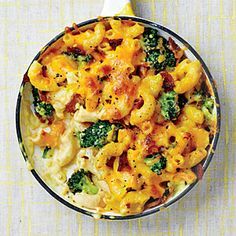 Note: The recipe tends to be very creamy, adding less chicken broth and more cheese would give it a true mac and cheese feel. Would also highly suggest adding more bacon. In all my recipes I use rice milk in place of regular milk.